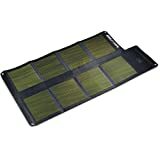 According to Amazon.com, these are the top-selling solar panels right now. This is a quick rundown of what they do and why you might want one of these solar panels for your home, car, RV, or for some other application (such as attic cooling with a solar powered fan). This kit is ideal for cabins, recreational vehicles, remote power, back-up power, and 12-volt battery charging. It comes with everything you need to start producing up to 15 Watts/125mA of clean, free power in all weather conditions. This was bought as a kit so it would have been nice if there was a connector on the input side of the controller that mated with the connector on the solar panel and a different style connector on the output that would be compatible with the cigarette-lighter adapter, etc. In other words- all set up to just plug in and go. Once I soldered and shrink-wrapped the new connectors on I’m pretty happy with it. Not everyone has the ability to properly terminate the wires. The Instapark SPCC-30W includes a 30-Watt mono-crystalline solar panel with solar charge controller. This solar panel is made of high efficiency mono-crystalline solar cells embedded in transparent vinyl acetate behind tempered glass with heavy back sheet ensuring maintenance free performance. Unlike amorphous solar panels, which only last about 5-7 years of continuous use, mono-crystalline solar panels can still retain over 80% of efficiency even after 25 years of continuous use. This panel is small and very easy to deal with. We picked up a 2 pin plug from Radio Shack so we could disconnect from the battery without having to access it. I run the cord through the electrical cord port. It was packaged well and everything was there. I am very happy with this panel and recommend it to anyone that would like to keep up a 12v battery under light use. I’m also pretty pleased I can leave it set up at home and not have to plug into the house. I’ll try to add some pictures soon. (PS. I don’t really think the controller is needed for such a small panel, but it is nice to see the led lights letting you know if it’s charging or sending power). This kit is designed and engineered to primarily charge 12-Volt batteries, which store and provide usable power when needed, ideal for powering your RVs, ATV, marine boats and electronic equipments. 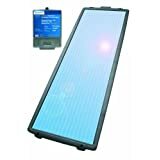 The included solar charge controller helps prevent any connected batteries from overcharging. I am pleased with the construction overall, but it does not look overly rugged. You won’t want to casually toss it around too much, but it should mount nicely to a solid surface. The aluminum frame has mounting holes on the back, but the clearance is very limited. I have a Brunton foldable solar panel that cost ten times as much and only puts out 3 times the amps (same voltage). I will be buying a larger Instapark product in the future. Overall, I am very pleased with this purchase. 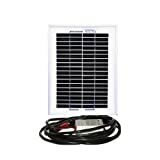 The MotoMaster Eliminator 12Volt Folding Solar Panel, also called the Sunforce Folding Solar Panel is ideal for hiking, camping, sporting events, on campus and at the beach. 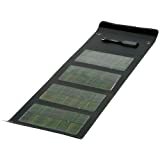 This solar panel is a flexible, foldable and durable solar product that produces enough power to charge rechargeable flash lights, lanterns, cell phones, GPS units, satellite phones, MP3 players and portable games. Just about anything that is capable of being charged through a standard cigarette lighter adapter (CLA -car charger) can be charged by SUNLINQ. parked out in the orchard quite well. I even ran over it with an empty trailer, and left it out in the rain! I can use large metal spring clamps to hang it anywhere to catch the afternoon sun. Haven’t tried it camping yet. The unit is qualified for recharging your cell phone, digital camera, portable multimedia player, GPS, and other digital devices. Besides, you will like the practical design which allows for multiple placement options. It can be clipped on the bag, attached on the vehicle window glass, or put on the ground with bracket. Brand New Product! Full 12 months warranty! 1:The Power bank included in picture is just for illustration. No power bank is included. If you need it (which you probably will), you have to buy it separately. 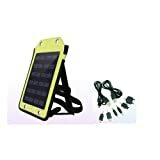 I highly recommend this solar panel if you have any mobile devices you might need to keep charged while camping or hiking. It’s small, light and provides enough power to charge many handheld devices. For this price, I have found it more than worth the money. 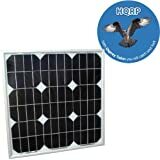 SOLAR ATTIC FAN WITH 20 WATT MODULE. INCREASES CFM TO 1200. Venting capacity of 1800 square feet of attic space per fan. 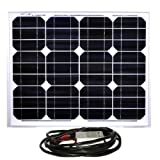 The 20 watt solar panel is 16.5″ x 19.75″ This solar unit may qualify for the 30% federal solar tax credit. Some experts think that solar attic fans are a waste of money because they’re under-powered with unproven life-expectancy. I was hesitant to buy one, but felt this brand offered solid engineering and construction, an unobtrusive low-profile, a powerful enough solar panel, and a great warranty. After two months of living with the fan, I am completely satisfied and unhesitatingly recommend it. Harness the power of the sun with this Battery Tender 5-Watt Solar Panel with built-in smart charging controller. It’s 100% portable and ideal for battery charging and maintenance, and for storage space without power access. 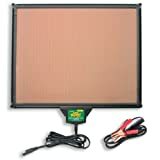 Battery Tender solar panels are the only panels available with a built-in charge controller to prevent overcharging. I bought this item to keep the battery on my car in shape. The car has sat since December and had a dead battery. The battery was fully charged in a day and I am very happy with how well it works. I would give it 5 stars but the cables are very short. CIGS (Copper Indium Gallium diSelenide) is the most efficient thin film solar technology available. By maximizing performance while optimizing portability, it makes the Solaris 26 the most compact high output model available. The built-in blocking diode prevents reverse battery discharge. Provides a lightweight, compact design that includes; Storage Sack, Vehicle outlet cable, Multi-link cable, Battery clamp cable. These panels as individuals (not linked) are serving me and my teams very well in Iraq. We use them to power everything from MP3 Players and cell phones to advanced GPS tracking systems. There’s only one problem I have, and that is linking more than two panels together. The instructions and box say it can be done, and the box says it includes a linking cable, but there is nothing that says how. You are supposedly able to link up to three panels together, but I am unable to accomplish this no matter how I configure the cables…. It’s been over a year and a half and it’s still holding up, no problems with wear and tear. I’m very pleased. The solar cells are encapsulated beneath high transmission tempered glass. The rear surface of the module is completely sealed from moisture and mechanical damage. Construction of the module minimizes weight while providing a durable, protective environment for the solar cells. Looking for a quiet inexpensive way to light my 400 sq ft cabin. A 20w panel with the hqrp battery charge controller did the trick. Coupled with a car battery, can run 2 thirteen w cf bulbs for a couple of hours. Have to admit…ordered another panel for more capacity! With the increase in CFM to 1200 this Solar Attic fan should be seeing a lot more rooftops. I always thought most of the solar fans on the market was somewhat undersized and most medium to large houses would require two fans which meant that going with a solar fan would not be cost effective. I agree with you completely. 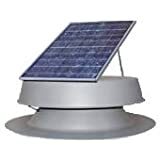 I saw a video where someone installed one of these solar attic fans, and it wasn’t even that complex… key was getting the roof sealed up completely after the installation, but other than that, it seemed like something anyone could do… and would save a lot of money on cooling. Thoughts on ways to get this information to be more interesting/accessible to the average homeowner?